The objective of the current research is to determine the influence of management control system (MCS) as a package on organization performance, and organizational capabilities play an important role to explain this relationship. Data were collected from general managers and chief financial officers from the textile industry of Pakistan to empirically test hypotheses of this study. One hundred sixty questionnaires were used in the analysis through partial least square equation modeling technique. The findings elucidated a significant influence of cybernetic, rewards and compensation, and administrative controls on organizational performance. The same findings were found with cultural, cybernetic, rewards and compensation, planning, and administrative controls with organizational capabilities. Despite this, planning controls and cultural controls have no influence on organizational performance. Organizational capabilities mediate the relationship between all five elements of MCS as a package and organizational performance. The findings provide insights to top management of the textile industry to enhance organizational performance by focusing on indicators mentioned in the study. In addition, improvements in organizational capabilities will also enhance organizational performance. The current research is the pioneer study that tests the mediating role of organizational capabilities between MCS as a package and organizational performance with the help of resource orchestration theory and resource-based view theory. Organizations work in a competitive environment, and if they want to exist in the current market, they face lots of challenges that reduce their performance. For instance, organizations face these challenges such as poor planning, cultural issues, monetary issues, rewards and compensation issues, administrative issues, business strategy issues, environmental uncertainty issues, leadership issues, capabilities issues, and issues regarding cybernetic controls. Organizational performance is a vital indicator of any organization success or failure. For instance, organizations that have high performance successful in the market and on the other hand those organizations that perform not well consider failure in the market. Nowadays, organizational performance playing a significant role for organizations especially in that environment where organizations face issues regarding higher competition (Cania, 2014). Organizational performance measures in term of both quantitative as well as qualitative term, and it is achieved by the efforts of individual employee and departments (Zehir et al. 2016). Moreover, the success of an organization based on their performance that how well an organization achieves its objectives (Randeree and Al Youha, 2009). Organizational performance means the effectiveness of an organization in the achievement of their desired goals (Henri, 2004). Meanwhile, organizational performance is a factor that measures how well an organization attains its desired goals (Hamon, 2004; Venkatraman and Ramanujam, 1987). Moreover, organizational performance playing a vital role in the existence of any kind of organizations such as profit-making organizations and non-profit making organizations (Abu-Jarad et al. 2010). Pakistan is a leading exporter as well as a manufacturer in textile goods and earns Rs. 1446.86 billion per year from textile exports. Pakistan textile industry contributes to a gross domestic product is 8.5% and more than 63% of Pakistan exports are from the textile industry. Textile sector is the biggest manufacturing sector and considers the backbone of the Pakistani economy (Aftab et al. 2017). Textile sector of Pakistan have very least market share that is less than 1% of the entire world share, and it is a high possibility that this sector grows in upcoming days (Ataullah et al. 2014). In Pakistan, the textile sector exports reduced due to some issues. For instance, high cost of production, lack of skilled labor, poor technology, lack of training programs, labor shift in other countries, poor production process, and low level of managerial capabilities (Iqbal et al. 2010; Khan and Khan, 2010; Shah et al. 2014; Shah et al. 2012). In Pakistan, the textile sector faces some challenges about management controls system (MCS) as a package (planning controls, cybernetic controls, cultural controls, rewards and compensation controls, and administrative controls) that leads to decrease organizational performance. Moreover, some of the studies show that Pakistan textile sector faces some issues about MCS and due to these issues performance of this sector going downwards (Ataullah et al. 2014; Iqbal et al. 2010). For instance, there are some issues regarding cultural controls such as lack of trust and lack of appreciation among employees, no collective method for problem-solving, and low employee morale (Ataullah et al. 2014; Iqbal et al. 2010; SohailRehan and Ayaz-ul-Haq, 2018), issues regarding bad planning such as use of old machinery, high cost of production, hire unskilled labor, and poor state of technology as well as process (Ataullah et al. 2014; Iqbal et al. 2010; Shah et al. 2012). One of the research shows MCS is the ignoring area in Pakistan (Maqbool-ur-Rehman, 2011). In the current study, our focus is only in planning controls and cultural controls; those are elements of MCS as a package that has less attention in Pakistani textile sector. MCS plays a significant role in enhancing organizational performance in both developing and developed economies. According to Koufteros et al. (2014), MCS is an indicator that has played a vital role in the enhancement of performance. In the current business environment, MCS considers an important indicator for organizations (Hanafi and Fatma, 2015). As MCS plays a significant role in enhancing organizational performance (Duréndez et al. 2016). Literature shows that MCS in isolations considers measuring organizational performance (Ballesteros Orozco, 2016; Henri, 2006; Koufteros et al. 2014). Moreover, most of studies conducted in developed countries with MCS in isolation but ignores MCS as a package to measures organizational performance and less attention has been paid in developing countries (Acquaah, 2013; Akroyd and Maguire, 2011; Auzair and Langfield-Smith, 2005; Henri, 2006; Henri and Journeault, 2010; Lopez-Valeiras et al. 2016; Tsamenyi et al. 2011). However, in one of the recent studies, the authors recommend that in developing countries there is a need to test the relationship between MCS and the performance of an organization (Bin-Nashwan et al. 2017). Some of the prior studies recommend that there is a need to study MCS as a package in future studies (Dropulić, 2013, 2014). Hence, this study examines the relationship between MCS as a package and organizational performance in developing countries that is Pakistan. Organizational capabilities play an important role in increasing organizational performance (Obeidat et al. 2017). According to RBV theory, organizational capabilities enhance the relationship between resources (MCS) and organizational performance (Barney, 1991). Research methodology plays a crucial role in any kind of research and this study quantitative in nature and data collected through the questionnaire technique. Results reveal that except cultural control and planning control, all variables have a significant influence on organizational performance. Moreover, MCS as a package all elements have a significant influence on organizational capabilities and organizational capabilities plays a significant role to enhance organizational performance. The major contribution of the current study is that we introduced organizational capabilities as a mediating variable for the first time, and it significantly mediates between MCS as a package element and organizational performance. The next part discussed the literature review regarding organizational performance, cultural control, planning control, cybernetic control, rewards and compensation control, administrative control, and organizational performance. In addition, hypotheses development, research methodology, research instruments, population and sampling, sample size, assessment of measurement and structural model, discussion and conclusion, theoretical implications, practical implications, and limitations and future direction were discussed in the next part. Organization performance becomes a significant indicator for organizations in the attainment of their objectives or goals in both developed and developing economies in small medium enterprises as well as in big organizations. According to Richard et al. (2009), organization performance is a factor that determines how well an organization achieves its objective. Prior researchers paid less attention than what factors included in an organizational performance that measures organizational performance well, e.g., financial performance or non-financial performance or both (Richards et al. 2008). Organizations overall focus goes to enhance their performance by increasing their profit (Lusthaus and Adrien, 1998). Although, organization performance is an important construct for most of the prior studies and unfortunately this construct not defined properly in studies (Dess and Robinson, 1984) because some of the organizations measures this construct differently to see their business objects. Meanwhile, organization performance includes the main three areas such as market performance, financial performance, and stakeholder return (Richard et al. 2009). The textile industry in Pakistan faces both financial performance and non-financial performance problems (Ataullah et al. 2014; Iqbal et al. 2010; Shah et al. 2012). Hence, this study focuses on both financial and non-financial performance to measure the performance of an organization. Organizational culture refers to the characteristics way of believing and behaving group of persons have developed over time and share in common within organizations (Tarique et al. 2015). Moreover, this view is supported in the accounting field by some of the prior researcher (de Chernatony and Cottam, 2008). This study used MCS as a package proposed by Malmi and Brown, 2008. In this package, the first element is cultural control that consists of three types of cultures such as clan culture, value-based culture, and the last one is the symbol-based culture. In firms, sometimes organizational culture not in the controls of managers and employees controls that culture. In organizations, there are sub-cultures that also exist and these sub-cultures are known as clans. According to Clegg et al. (2015), in organizations, there are various sub-cultures exist. Moreover, in organizations, different sub-cultures exist, and these are known as clans (Malmi and Brown, 2008). H1: Cultural controls have a significant influence on organizational performance. H2: Cultural controls have a significant influence on organizational capabilities. H3: Planning controls have a significant influence on organizational performance. H4: Planning controls have a significant influence on organizational capabilities. H5: Cybernetic controls have a significant influence on organizational performance. H6: Cybernetic controls have a significant influence on organizational capabilities. H7: Rewards and compensation controls has a significant influence on organizational performance. H8: Rewards and compensation controls has a significant influence on organizational capabilities. Administrative controls refer to a definite management control mechanism that organizations use to give the direction of their manager behaviors in the achievement of their goals (Chhillar, 2013). In this research, administrative controls are adopted from MCS as a package proposed by Malmi and Brown, 2008. Administrative controls consist of three elements such as organization structure and design, governance structure, and policies and procedures (Malmi and Brown, 2008). Organization design plays an important role and top management uses in building a particular type of contacts and relationships (Abernethy and Chua, 1996; Alvesson and Kärreman, 2004). Moreover, the structure of an organization is a kind of control that works through functional specializations and contributes to control by reducing the volatility of behavior and in the answer increases its predictability (Flamholtz, 1983). Governance structure relates to board structure as well as its composition and various management and project teams (Malmi and Brown, 2008). Policies and procedures refer to an approach that used within organizations to specify organization processes and behaviors (Malmi and Brown, 2008). H9: Administrative control has a significant influence on organizational performance. H10: Administrative control has a significant influence on organizational capabilities. H11: Organizational capabilities have a significant influence on organizational performance. H12: Organizational capabilities mediate the relationship between cultural controls and organizational performance. H13: Organizational capabilities mediate the relationship between planning controls and organizational performance. H14: Organizational capabilities mediate the relationship between cybernetic controls and organizational performance. H15: Organizational capabilities mediate the relationship between rewards and compensation controls and organizational performance. H16: Organizational capabilities mediate the relationship between administrative controls and organizational performance. In the current study, we are using the RBV theory and resource orchestration theory to explain the theoretical framework. Organizational resources used separately do not give assurance that the organization attains better competitive advantage and organizational performance; instead, organizational resources should be accumulated, leveraged, and bundled that mean full values of organizational resources to enhance organizational performance is achieved only in that case when organization manage their resources effectively (Sirmon and Hitt, 2003; Sirmon et al. 2007). Sirmon et al. (2007) recommend that managing resources includes three steps such as structuring portfolio of organizational resources, bundle organizational resources in building capabilities, and the last one is leveraging the capabilities in the marketplace in creating value. According to Barney (1991), organizational capabilities explain the relationship between resources (MCS) and organizational performance. Research methodology plays an important role in any type of research to examine the research objectives. Researchers paid more attention to this part because this determines the purpose of any type of research. There is a need to employ appropriate analysis techniques in achieving research objectives and attempt to solve theoretical as well as practical problems. Therefore, in the current study, to see nature, objectives, and research problem, we used a quantitative approach as well as cross-sectional design chosen to collect data through a questionnaire. The conceptual framework of current study contains seven constructs. Each construct measured by using various items. Some prior studies used to adapt items of constructs. Significantly, every item is measured with a 5 Likert scale that ranges from strongly agree (5) to strongly disagree (1). Cultural controls consist of 16 items and were adapted from Sampe, 2012; planning controls consist of 13; cybernetic controls consist of 8; rewards and compensation controls consist of 6 items that adapted from Hanzlick and Brühl, 2013; administrative controls consist of 9 items that adapted from Ramamurthy, 1991, organizational capabilities contains 15 items and adapted from Koufteros et al. 2014, and organizational performance consists of 11 items and adapted from Henri, 2006; Teeratansirikool et al. 2013. This study is based on the textile industry of Pakistan, and respondents consist of top management of textile industry under All Pakistan Textile Mills Association (APTMA) in Pakistan. Chief financial officers (CFO) and general managers were chosen to collect data. CFO and general managers were chosen because these are the person in the textile organization that has much knowledge regarding MCS as a package, organizational capabilities, and organizational performance. Five-point Likert scale was used to collect data because this technique minimizes the frustration level among respondents while filling questionnaires as compared to other techniques such as a seven-point Likert scale (Babakus and Mangold, 1992). The range of this scale consists strongly disagree (1) to the strongly agree (5); this scale recommended most of the researchers because it reduces irritation level that enhances response rate as well as response quality (Sachdev and Verma, 2004). Furthermore, the simple random sampling technique used to collect data from required respondents as this technique provides an equal chance of every respondent for selection (Sekaran and Bougie, 2016). According to Salkind and Rainwater (2003), this technique has lots of advantages, and one of them is that no biases from the researcher side during the selection of respondents. Moreover, a simple random sampling technique uses most of the prior researchers, and it provides generalized results. According to Comrey and Lee (1992), a sample size less than 50 respondents is considered weaker, 51 to 100 is considered as weak, 101 to 200 is considered as adequate, 300 is considered as good, 500 respondents is considered as good, and 1000 is considered as excellent. Hence, this study used a sample size of 201 that is considered as adequate. Data were collected from CFO and general managers via personally administered questionnaires. Two hundred one questionnaires distributed among CFO and general managers and 1 questionnaire from 1 organization. In those organizations where both CFO and general managers exist, the questionnaires were filled by anyone from both. Two hundred one questionnaires were distributed among respondents, and only 160 questionnaires were used for analysis and 41 questionnaires were excluded due to some missing values and some not returned back. In Pakistan, where almost the males dominate, 79.6% that filled the questionnaires in this study were males. Demographic profile elaborated that in Pakistan textile industry male are dominant. In the sample, 79.6% of male respondents, most of the respondents were a master degree holder. Majority of respondents have experience between 5 and 15 years, and most of the organization have employees within the range of 301 to 1000. Average annual revenue of most of the textile organizations was within the range of 100 to 600 million Pakistani rupees. In the current study, we are using SmartPLS 3.0 to examine the theoretical framework. As prior studies reveal that PLS technique is the best in handling both complex large and simple models, and there is no need to meet the normality criteria with subtleness (Bamgbade et al. 2015; Hair Jr et al. 2014). Moreover, some of the studies conclude that PLS-SEM technique is better in estimating results as well as in establishing variable validities as compared to another approach that is a covariance-based technique (Afthanorhan, 2013; Hair Jr et al. 2014). There are two models estimated in PLS-SEM technique such as measurement model and structural model. In the current study, we are using both. There are three things required to measure inner or measurement model; first is content validity, second is convergent validity, and the last one is discriminant validity (Hair Jr et al. 2013) (Figs. 1 and 2). Content validity refers to a situation in which items that measure variable show greater loading on their own variable than other variables in a theoretical framework. In line to see the recommendations of prior studies (Hair Jr (2010) and Chin (1998)), current study uses loadings to determine content validity as demonstrated in the table of cross-loadings (Table 1). In the current research, every item of variables loaded highly on their own variable and greater than other variables. The objective behind convergent validity is to make sure the variable items that used in the current study reflects effectively their corresponding factor (Zhou, 2013). Basically, convergent validity demonstrates the level to which an indicator correlates in a positive way with another indicator of the same variable (Hair Jr et al. 2014). In the SEM technique, convergent validity is determined by three things such as loadings, average variance extracted (AVE), and composite reliability (CR). Significantly, factor loadings of items should be loaded highly and statistically significant to measure their respective variables. Factor loading of items should be 0.50 or more, and CR and AVE should be at least 0.70 and 0.50 respectively. According to Hayduk and Littvay (2012), if an item has a factor loading less than 0.50, that item should be deleted and the remaining best items retained to achieve desired CR and AVE of current research. Moreover, items that have factor loading higher than 0.50 or best items will help in building a sound theoretical framework (Hayduk and Littvay, 2012). According to Nunnally (1978), Cronbach’s alpha value of all variable of study should be at least 0.60. As demonstrated in Table 2, we obtain CR, AVE, factor loadings, Cronbach’s alpha, and rho_A that exceeded standardized value. Hence, the current study confirms the convergent validity of the theoretical model (Bagozzi and Yi, 1988). Table shows that values of CR greater than 0.60, AVE 0.50, and factor loadings are higher than 0.50 as suggested (Hair Jr et al., 2013). Discriminant validity refers to a situation in which we see that two indicators are statistically different. Moreover, discriminant validity demonstrates the level to which a variable in the actual term is dissimilar from another variable on the basis of empirical gauges (Hair Jr et al. 2014). The items of a specific variable must have variances greater than other construct variance. The current research determines discriminant validity to see the recommendations of (Fornell and Larcker, 1981) by comparing diagonal above values with their below values. Moreover, it is very simple for scholars/researchers to conclude regarding discriminant validity that diagonal value must be higher than the below values in the same columns. Table 3 demonstrated discriminant validity. After determining content validity, convergent validity, discriminant validity, and reliability, the next phase is to determine the proposed hypotheses to run two things in SmartPLS 3.0 such as Algorithm as well as Bootstrapping technique. As demonstrated in Fig. 3 and Table 4, we have 16 hypotheses including 11 direct hypotheses and 5 indirect (mediating) hypotheses. From the direct hypotheses, five hypotheses are supported and only two are not supported. For example, cultural controls have no relationship with organizational performance as beta value 0.020, t value 0.303, and p > 0.05. Moreover, cultural controls have a significant influence on organizational capabilities beta value of 0.253, t value 3.302, and p < 0.05. Planning controls have no influence on organizational performance (β = 0.074, t = 1.109, p > 0.05). Meanwhile, planning controls have a significant influence on organizational capabilities (β = 0.266, t = 2.488, p < 0.05). Cybernetic controls have a significant influence on organizational performance as beta value 0.178, t value 2.657, and the p value of 0.008. Likewise, cybernetic controls have a significant influence on organizational capabilities as β = 0.247, t = 2.242, and p < 0.05. Rewards and compensation controls have a significant influence on organizational performance (β = 0.175, t = 2.916, p < 0.0.05). 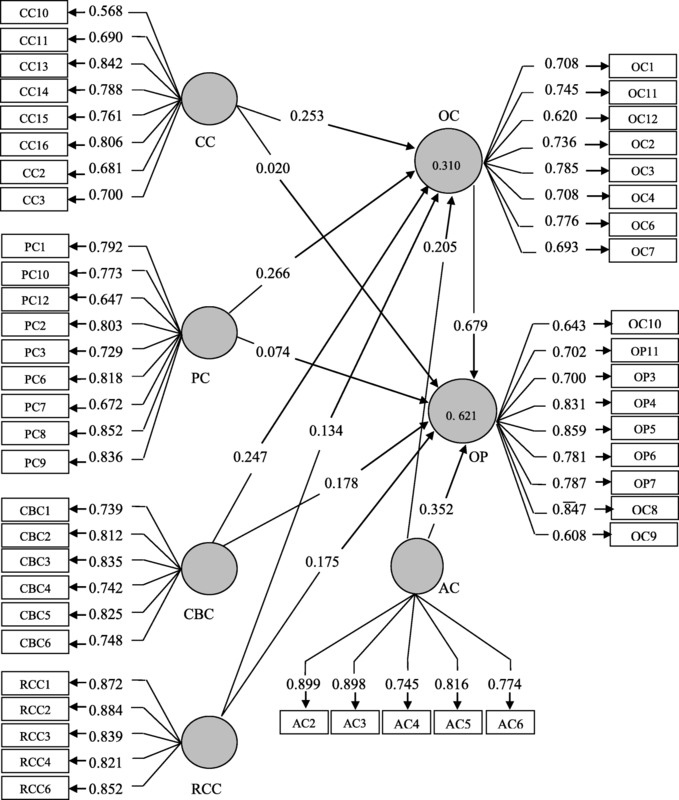 Moreover, rewards and compensation controls have a significant influence on organizational capabilities (β = 0.134, t = 2.037, p < 0.05). Administrative controls have a significant influence on organizational performance as β = 0.252, t = 4.682, p < 0.05. Meanwhile, administrative controls have a significant influence on organizational capabilities (β = 0.205, t = 2.354, p < 0.05). Organizational capabilities have a significant influence on organizational performance as beta value = 0.679, t value = 9.704, and p value < 0.05. Organizational capabilities significantly mediate the relationship between cultural controls, planning controls, cybernetic controls, rewards and compensation controls, administrative controls, and organizational performance. In this respect, only H1 and H3 are not accepted, and the remaining hypotheses are all accepted. The current study used two things to determine the predictive relevance of our model; first is R2 and the second is cross-validated redundancy. R2 helps to determine the level of variance of the dependent construct that all independent variables explain. Table 5 demonstrated that 62.1% organizational performance is collectively explained by all independent variables while 31% of the variance in organizational capabilities is also explained by all independent variables. According to Cohen (1988), if the value of R2 is greater than 0.26, then it is considered as substantial, the R2 value within the range of 0.13 to 0.26 is considered moderate, and value within the range of 0.02 to 0.13 is considered weak. In the current research, R2 values of organizational capabilities and organizational performance lies in substantial case. In addition, the second thing used to determine research model quality is cross-validated redundancy. In SmartPLS, this is done by using the blindfolding technique, and this process entails the researcher to eliminate a few data values that would be considered missing values. In blindfolding running technique, omission distance is 7; after running this process, some certain values generated and then compare with the assumed results with real results that show how close or far away. However, the criterion of the predictive relevance of model is that values must be above than 0, and Table 5 shows that the current study fulfills this criterion. Cross-validated redundancy for organizational capabilities is 0.137 and organizational performance is 0.322. In the study model, the R2 of the dependent variable is that this value demonstrates model strength. Therefore, variation in R2 value with the elimination of an independent variable in the model could be used to know eliminated variable contribution on the dependent variable (Hair Jr et al. 2014). The measure is called an effect size, and this is obtained by eliminating the independent variable once from the study model, and the outcomes of this act are R2 excluded. After that again, that variable includes in the model and eliminates another independent variable. According to Cohen (1988), effect size (f2) values 0.02 specify a small effect, 0.15 specify medium size effect, and 0.35 specify that effect size is high. Table 6 demonstrate that all independent variables have small effect size except administrative controls that have moderate effect size, and organizational capabilities have high effect size that indicates the contribution of each independent variable in whole model variance. Table 7 shows that all independent variables have small effect except cultural controls that have a moderate effect. The intention behind this paper is to determine the influence of planning controls, rewards and compensation controls, and cultural controls on organizational performance with the mediating role of organizational capabilities. This research was descriptive as well as quantitative in nature. Findings elucidated that cultural controls have an insignificant influence on organizational performance, and our hypothesis H1 is not accepted. Hence, this study reveals that cultural control directly has no influence on organizational performance, and organizational capabilities might change this relationship from insignificant to significant. Cultural controls have a significant influence on organizational capabilities, and our hypothesis H2 is accepted. This states that cultural control plays an important role in determining organizational capabilities that ultimately have an influence on organizational performance. Findings revealed that planning controls have an insignificant impact on organizational performance, and our hypothesis H3 is not accepted. It shows that planning control directly has no influence on organizational performance but might be influenced by organizational performance through organizational capabilities. Planning controls significantly and positively influence organizational capabilities and our supported hypothesis H4. Cybernetic controls have a significant influence on organizational performance and supported our hypotheses H5. Cybernetic controls have a significant influence on organizational capabilities and accepted our hypotheses H6. This gives an idea to the top management to focus on cybernetic controls if they want to enhance organizational performance. It plays a significant role in decision-making. Rewards and compensation controls have a significant influence on organizational performance and supported our hypotheses H7. Rewards and compensation controls have a significant influence on organizational capabilities and accept H8. This study reveals that top management of textile sector gives importance to rewards and compensation control in their organization if they want to improve organizational performance. Administrative controls have a significant influence on organizational performance and supported our hypotheses H9. Moreover, administrative controls have a significant influence on organizational capabilities and supported our hypotheses H10. Top management in the textile sector can improve their performance by focusing on administrative control because it has a significant influence on both organizational capabilities and organizational performance. Organizational capabilities significantly and positively influence organizational performance and supported our hypotheses H11. Moreover, organizational capabilities significantly mediate the relationship between MCS as a package (cultural controls, planning controls, cybernetic controls, rewards and compensation controls, and administrative controls) and organizational performance. Hence, our hypotheses H12, H13, H14, H15, and H16 are supported. Results of this study match with RBV theory that organizational capabilities enhance the relationship between organizational resources (MCS as a package) and organizational performance. Moreover, this study gives fruitful results by using resource orchestration theory as the assumption of this theory is that resources should be used in a bundle form. Prior studies use MCS in isolation form, and this study used MCS as a package and bundle resources that provides better results. Current research significantly contributes to the body of knowledge regarding planning controls, cultural controls, organizational capabilities, and organizational performance in Pakistan textile industry. In Pakistan, this is an ignoring area and there is a need to study MCS as a package in manufacturing as well as service sector. This study overcomes some issues and uses three indicators that have an influence on organizational performance. Current research made a significant theoretical contribution in terms of critically considering the influence of MCS as a package on organizational performance with the involvement of the mediating effect of organizational capabilities that prior studies ignore. By incorporating all these constructs into one model, the current study has been able to answer further research on these variables. In addition, the current study organizational capabilities are used as a mediating variable to explain the relationship between MCS as a package and organizational performance. It considers a theoretical contribution to organizational performance. The current study is a pioneer study that determines the influence of MCS as a package on organizational performance with the involvement of organizational capabilities. This is the first study that empirically determines the relationship between MCS as a package with organizational performance with the help of mediating variable organizational capabilities. The results of the current research have various practical implications for top management organizations. The study elucidated that some indicators play an important role in influencing organizational performance. For example, rewards and compensation control significant and positive influence on organizational capabilities (mediator) that ultimately influence organizational performance. The current study recommends that top management should not focus only on extrinsic rewards but should also focus on intrinsic rewards because employees need tangible and intangible rewards. The performance of employees from organizations that pay high salaries to employees but do not give intrinsic rewards reduces day by day due to this problem. Findings of this article, therefore, place responsibility on top management of organizations to incorporate both intrinsic and extrinsic rewards. Nowadays, various organizations started to focus on both types of rewards (Rehman et al. 2018). For instance, Apple, Microsoft, and Sony focus to pay both types of rewards to their employees. In addition, the positive influence of cultural controls, planning controls, cybernetic controls, rewards and compensation controls with the mediating role of organizational capabilities on organizational performance acquires the textile industry to start rethinking their own strategies and divert top management attention to organizational capabilities. Organizational capabilities are a significant resource of an organization that has a strong positive influence on organizational performance. According to resource orchestration theory, organizational resources used separately do not give assurance that organization attains better competitive advantage and organizational performance; instead, organizational resources should be accumulated, leveraged, and bundled that mean full values of organizational resources to enhance organizational performance is achieved only in that case when organization manage their resources effectively (Sirmon and Hitt, 2003; Sirmon et al. 2007). In the current study, we combine organizational resources with five elements of MCS as a package in bundle form with the help of organizational capabilities to explain this relation more and get better results. The findings elucidated that our results strongly confirm the resource orchestration theory. Top management must see organizational capabilities in organizations to measure company performance. A current study is just like other studies that have few limitations that must be considered in further studies regarding these variables. First, the current study was conducted in Pakistan that is a developing country and in the manufacturing sector such as the textile industry. Hence, in the future, there is a need to study these variables in other countries that are into manufacturing as well as service industry. Second, this study uses a small sample size, and there is a need to enhance this size in future studies. Third, the current study uses MCS as a package to determine organizational performance with the help of organizational capabilities as a mediating variable. There is a need to conduct a study between MCS as a package with organizational performance in developing and developed countries with the involvement of organizational culture as a moderating variable by using resource-based view theory. We would thankful to “Associate Professor Dr. Che Zuriana Muhammad Jamil” that gives us valuable instructions and make us capable to produce good research. The authors received no funding for the design of the study, data collection, analysis, and interpretation of data or the writing of the manuscript. Prior studies on MCS as a package uses interview approach to collect the data this study use questionnaire approach to collect data instead of interviews, as cited in the body of manuscript and reference are given in the bibliography. However, primary data were collected from respondents. The dataset used and analyzed during this study is available from the corresponding author on reasonable request. The corresponding author, SUR, presented the main idea, worked on the literature, data collection, and analysis of this study. HA worked on findings, discussion, and conclusion of this study. Finally, RM majorly worked on proofreading. All authors read and approved the final manuscript.